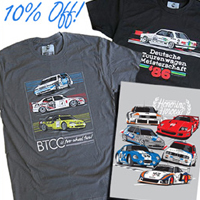 10% OFF All 8380LABS Posters, Apparel and Accessories! The essence of automotive obsession is captured with 8380 Labs and to help celebrate July 4th take 10% OFF all 8380 Labs products until July 6th. Take a look at the latest artwork, including everything from reproductions of classic livery prints to features of some of the most inspirational winners from Le Mans and touring car championships across Europe, Australia, Japan and more. Find your design and remember to apply the promo code 8380 at checkout.